The International day of Women was created in recognition and to celebrate the Rights of women workers, in order to promote their participation in the struggle for equity and equality, which presently is one of the UN Millennium Development Goals/MDGs.. and in the upcoming Sustainable Development Goals/SDGs, it is being considered as a possible stand alone goal, so, women can have an effective equal presence with men, for social and personal development. In the Sustainability and Social development Agenda, gender perspective and women rights are considered to be key to the eradication of poverty and hunger, and to the creation of the WORLD AND FUTURE THAT MUST BE CREATED FOR THE CARE OF PRESENT AND FUTURE GENERATIONS AND THE URGENT CARE OF THE PLANET. 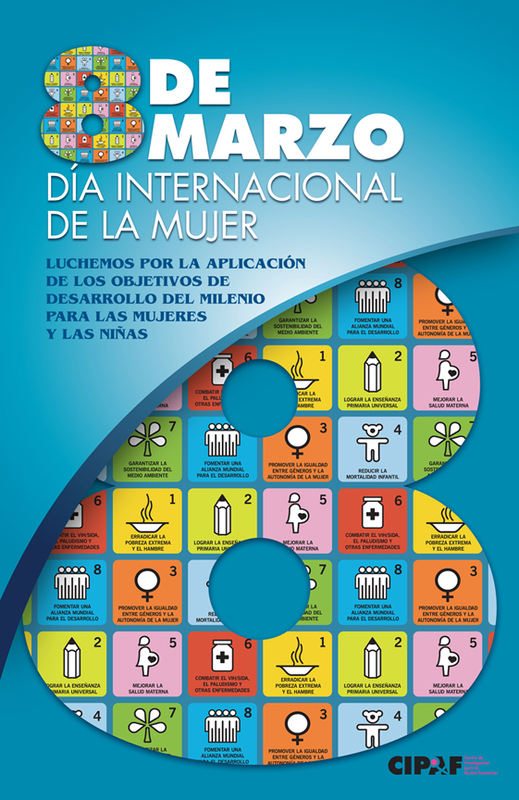 It was first celebrated on 8th March1911, in Germany, Austria, Denmark and Switzerland The United Nations at its General Assembly in 1977, proclaimed 8th March as the International Day for Women´s Rights, and now this celebration and commemoration is in most countries a Nationally celebrated day. Today, in spite of all the work about it, the concern on all types of violence and discrimination against women continues to be a major issue and concern, to the point that in many countries there are offices to monitor them as femicides. El Salvador, Guatemala and Mexico are concrete examples of this situation, which happen in many more countries and still does not seem to be effectively addressed. Violence against women is not just what is happening to individual women, we see that the educational, economic, social and cultural aspects of the current systems, at local, national and global levels must intentionally work with a transformational agenda to be able to achieve this urgently needed change, that not only robs women and societies of peace, but does not allow the qualitative development for the new paradigm to become a reality in our life time. There are aspects, many historical, many legal, many cultural, and economic that affect directly the maintenance of this reality: the colonial and slave enterprise, the international division of labor, the forced impoverishment that maintains people to live in survival, which in turn needs to force women into the care and the so called informal economy and to be cheap labor. All these conditions are based in ignorance and a culture of discrimination and the exploitation of peoples and whole nations, this is what we consider to be the extractive model of development, which is based in the violations of all human rights, the economic,social and cultural rights of peoples, and the rights of the planet and the environment. The structures of the state, must reflect the commitment to this understanding, that this is a matter of peace and of national security, thus there must be policies of state and administration of government that in fulfillment of the national constitution go about meeting in a timely manner, these demands for the well being of all, and the care of the planet. The national and international budgets must reflect this commitment. This is not about assistance, but about real transformation of all the endeavors of national and global society. If a country finds a way to meet the basic needs of women by taking loans that the whole society must pay, but the national constitution, and the various policies and services do not show the timely commitment for equity and equality, the chance to eradicate poverty and hunger will only be about the alleviation of these two major indicators of real development and sustainability It is then urgent and important not to fall in such a trap, which only comes to add to the financial and economic indebtedness of the society, and nations, to say the least, and to maintain the system of inequality and impoverishment as it basically exist.. If we are serious about this commitments and we keep our eyes wide open, and our eyes in the prize as the Dr. Martin Luther King Jr., called us to be, we will be able to detect the countless very costly gimmicks that are being created and carried out today, under the guise for women equality and for the defense of their rights. It is time to go from the promises to real action, it can be done, and the enjoyment of the fullness of life can be a reality sooner rather than later.Now is the time… let us move now. A way to contribute to this societal change of paradigm about equity and equality for all, and in particular for women, it is most important to make sure we have clarity of the call, FOR THE WORLD AND FUTURE THAT ARE NEEDED FOR THE CARE OF PEOPLE AND PLANET, FOR THE ERADICATION NOT THE ALLEVIATION OF POVERTY AND HUNGER. Women, youth/children, migrants, older adults, first nations, LGBT, people with special challenges, rural and coastal peoples, who have been and are traditionally excluded must be intentionally listened to, and brought into the circle of all. Do remember that there is lots of expertise in our communities, we know how to transform the situations we have to face, besides resisting them, we create possibilities. When we say we know how to end poverty and hunger, listen to us.. it is because of the illegal colonial practices, that we do not have our lands, water, seeds.. we know how to feed people, we have been doing this in spite of the land graving that is still going on. See our expertise. Do not continue to dismiss it, commit to not do it any more. Know that INGOs and NGOs can only accompany us in the social transformations that must happen, but each of person can choose to walk with us. Do not look down on us, nor use our situation to live privileged life. For our communities peace and development are one and the same.. and happiness is what we see as a good result of them… success and progress do not mean the same to us as those people that see them as privilege, position and money. The UN is a peace organization, thus all its work must be for the enjoyment of a culture of peace. We understand that there is a critical financial and economic crisis, a crisis of employment and an environmental – climate change crisis that are impacting very negatively all aspects of life and that is also at the roots of conflict and violence, and wars. Joint civil society action around Post-2015 has to focus on goals and commitments for the countries of the North, the necessary changes of the consumption and production patterns in these countries, and the structural framework conditions shaped by these countries, particularly in the global financial, investment and trade systems. This call to do this urgent work is best understood and underlined by a message from Bolivians on the terrible floorings they are suffering today: Therefore the Bolivian tragedy cannot be blamed only in climate change but in the fatal combination of causes all related to the thirst for energy of the occidental way of life. Secure Safe and Sustainable and Just Production and Consumption Patterns and eliminate hazardous substances and technologies. Guarantee (100%) application of the precautionary principle and the polluter pays principle to policies and programs on sustainable production and consumption and to new and existing technologies, products and waste management processes. Ensure full application of prior free and informed consent: Indigenous and local knowledge systems and technologies are adequately recognized, protected, strengthened and used ensuring control by the indigenous communities. Women and other affected groups participate effectively in decision-making throughout all stages of technology development, including assessment. Eliminate (100%) hazardous substances: Phase out harmful substances and chemicals and radioactive substances linked with persistent and/or irreversible damage to humans and the environment. Harmful chemicals: hazardous pesticides, endocrine disrupting chemicals, CMRs, PB…etc. 100% Internalization of environmental costs for the full life-cycle of products; this includes full insurance costs for greatest expectable accidents in case of high-risk technologies. Currently, nuclear power operators and many other high-risk industrial complexes, are exempted from insurance obligations, which means that in case of accidents, the tax-payer/ citizens end up paying for the damage. Full environmental and social corporate reporting and accountability. Set binding criteria that industrial production and consumption practices, especially extractive industries, do not cause violence, toxic pollution, displacement, poverty, resource scarcity, gender disparity, or environmental degradation. Enact corporate social accountability standards are put in place to enforce decent labor conditions and prevent overuse and overproduction of resources and pollution by investors and corporations. Ensure access to environmentally sound technologies, developing countries have equitable access to technologies, agreement on lifting of intellectual property barriers and measures to ensure that knowledge is in the public domain. Full technology assessment and authorization: Ensure independent social and environmental impact assessments to monitor and evaluate new and existing industries by establishing a multilateral mechanism for ecological, social, cultural, and economic evaluation of technologies. Enact moratorium on all technologies that can damage Earth cycles, such as geo-engineering and deep sea mining.